Sierra Leone is a West African country, which shares common boundaries with Guinea Bissau and Liberia at the North and South respectively, although it is among the few populated countries with the population of about 7million people. This country is blessed with natural resources such as gold, diamond, silver, bronze and more. Recently, even crude oil has been discovered in the current tenure of president Sir Anex Bai Koroma. For the fact that this country is naturally rich, it attracts business men and women from all over the world because of its good and business-free environment. As it is usually done, any foreign country that contributes immensely to the growth and development of this country Sierra Leone is usually given an awarded at the end of each year. 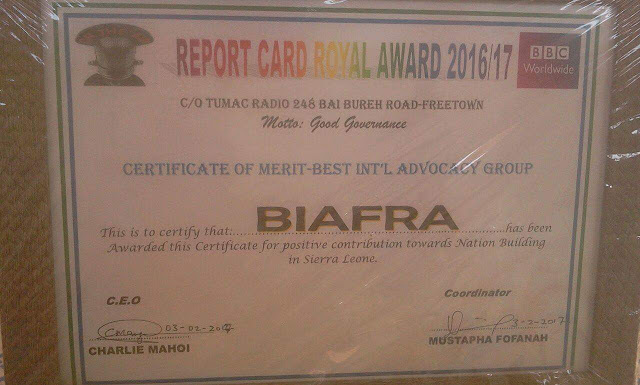 Proving to its populace that Biafrans are great, kind, and are peace loving people, the Indigenous People of Biafra, IPOB, in Sierra Leone were awarded with the BEST INTERNATIONAL ADVOCACY OF THE YEAR IN SIERRA LEONE. The award in connection with the BBC was presented to IPOB on the 4th of February 2017 being Saturday, during an IPOB general meeting in Freetown. The award was handed over to the coordinator of IPOB Sierra Leone, Apostle Timothy Ugochukwu Ogbodo by the CEO and the Coordinator of Tumac Radio fm Freetown Sierra Leone, Charlie Mahoi and Mustapha Fofana. I stand for biafra all the way.